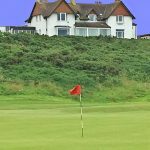 Situated opposite the 2nd fairway with views over the famous Cruden Bay Links. Recently refurbished – ideal location for any golfing holiday. A self-catering apartment is also available.